Found mostly in India, the black buck is one of the most photographed of wildlife species. These antelopes are counted among the fastest animal species on earth. They can run at a speed of 50 miles/hour. This high speed and a keen eyesight account for their protection much. The population of the Indian antelope has been badly affected by poaching and loss of habitat. 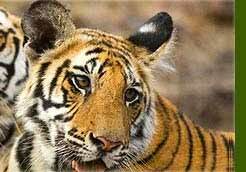 However, wildlife conservation measures are on to make these wonderful creatures able to survive a few more years. The Indian antelope is one of the most elegant of all antelopes; its due to its striking colour and wonderful spiral horns. 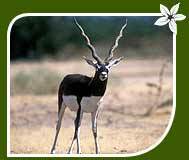 The upper body part of a male black buck is covered with black fur while the chest, belly and the inner sides have white fur. A beautiful contrast indeed! White rings around their eyes add much to the beauty of their features. The average weight of a balck buck is 40 kg. Horns, that may have three to four turns, measure between 50 and 65 cm. Horned females are rarely spotted. Though there is no particular time for breeding, the period between February and March is quite interesting, as this is the time when the bucks fight against each other to acquire the does. Native to India, the black buck inhabit open grasslands, dry thorn and scrublands. Poaching has done much harm to the Indian antelope. 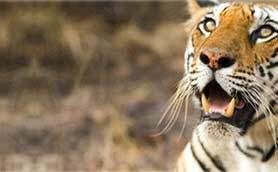 Today, they have been confined to open grasslands along rivers like Godavari, Krishna, Pennar and their tributaries in the state of Andhra Pradesh and at Point Calimre in Tamil Nadu. The Wildlife Tour of Black Buck Antelope lives on grass. Leaves, pods, fruit, shrubs and flowers also constitute its vegetarian diet. The lifespan of a black buck varies from 12 to 16 years. 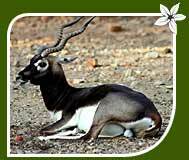 The black buck is a major draw for wildlife visitors to India. There are a number of sanctuaries and national parks where the graceful Indian antelope can be easily spotted.